"CH4" redirects here. For other uses, see CH4 (disambiguation). For the emergency service protocol, see ETHANE. Methane (US: /ˈmɛθeɪn/or UK: /ˈmiːθeɪn/) is a chemical compound with the chemical formula CH4 (one atom of carbon and four atoms of hydrogen). It is a group-14 hydride and the simplest alkane, and is the main constituent of natural gas. The relative abundance of methane on Earth makes it an attractive fuel, although capturing and storing it poses challenges due to its gaseous state under normal conditions for temperature and pressure. Natural occurring methane is found both below ground and under the sea floor, and is formed by both geological and biological processes. The largest reservoir of methane is under the seafloor in the form of methane clathrates. When methane reaches the surface and the atmosphere, it is known as atmospheric methane. The Earth's atmospheric methane concentration has increased by about 150% since 1750, and it accounts for 20% of the total radiative forcing from all of the long-lived and globally mixed greenhouse gases. Methane has also been detected on other planets, including Mars, which has implications for astrobiology research. Methane is a tetrahedral molecule with four equivalent C–H bonds. Its electronic structure is described by four bonding molecular orbitals (MOs) resulting from the overlap of the valence orbitals on C and H. The lowest energy MO is the result of the overlap of the 2s orbital on carbon with the in-phase combination of the 1s orbitals on the four hydrogen atoms. Above this energy level is a triply degenerate set of MOs that involve overlap of the 2p orbitals on carbon with various linear combinations of the 1s orbitals on hydrogen. The resulting "three-over-one" bonding scheme is consistent with photoelectron spectroscopic measurements. At room temperature and standard pressure, methane is a colorless, odorless gas. The familiar smell of natural gas as used in homes is achieved by the addition of an odorant, usually blends containing tert-butylthiol, as a safety measure. Methane has a boiling point of −164 °C (−257.8 °F) at a pressure of one atmosphere. As a gas it is flammable over a range of concentrations (5.4–17%) in air at standard pressure. Solid methane exists in several modifications. Presently nine are known. Cooling methane at normal pressure results in the formation of methane I. This substance crystallizes in the cubic system (space group Fm3m). The positions of the hydrogen atoms are not fixed in methane I, i.e. methane molecules may rotate freely. Therefore, it is a plastic crystal. The primary chemical reactions of methane are combustion, steam reforming to syngas, and halogenation. In general, methane reactions are difficult to control. Partial oxidation of methane to methanol is challenging because the reaction typically progresses all the way to carbon dioxide and water even with an insufficient supply of oxygen. The enzymes methane monooxygenase produces methanol from methane, but cannot be used for industrial-scale reactions. Some homogeneously catalyzed systems and heterogeneous systems have been developed, but all have significant drawbacks. These generally operate by generating protected products which are shielded from overoxidation. Examples include the Catalytica system, copper zeolites, and iron zeolites stabilizing the alpha-oxygen active site. One group of bacteria drive methane oxidation with nitrite as the oxidant in the absence of oxygen, giving rise to the so-called anaerobic oxidation of methane. Like other hydrocarbons, methane is a very weak acid. Its pKa in DMSO is estimated to be 56. It cannot be deprotonated in solution, but the conjugate base is known in forms such as methyllithium. 7, have been studied theoretically and conjectured to be stable. Despite the strength of its C–H bonds, there is intense interest in catalysts that facilitate C–H bond activation in methane (and other lower numbered alkanes). Methane bubbles can be burned on a wet hand without injury. Peters four-step chemistry is a systematically reduced four-step chemistry which explains the burning of methane. where X is a halogen: fluorine (F), chlorine (Cl), bromine (Br), or iodine (I). This mechanism for this process is called free radical halogenation. It is initiated when UV light or some other radical initiator produces a halogen atom. A two-step chain reaction ensues in which the halogen atom abstracts a hydrogen atom from a methane molecule, resulting in the formation of a hydrogen halide molecule and a methyl radical (CH3•). The methyl radical then reacts with a molecule of the halogen to form a molecule of the halomethane, with a new halogen atom as byproduct. Similar reactions can occur on the halogenated product, leading to replacement of additional hydrogen atoms by halogen atoms with dihalomethane, trihalomethane, and ultimately, tetrahalomethane structures, depending upon reaction conditions and the halogen-to-methane ratio. Methane is used as a fuel for ovens, homes, water heaters, kilns, automobiles, turbines, and other things. Activated carbon is used to store methane. Gaseous methane is also used as a rocket fuel when combined with liquid oxygen, as in the BE-4 and Raptor engines. As the major constituent of natural gas, methane is important for electricity generation by burning it as a fuel in a gas turbine or steam generator. Compared to other hydrocarbon fuels, methane produces less carbon dioxide for each unit of heat released. At about 891 kJ/mol, methane's heat of combustion is lower than that of any other hydrocarbon. However, it produces more heat per mass (55.7 kJ/g) than any other organic molecule due to its relatively large content of hydrogen, which accounts for 55% of the heat of combustion but contributes only 25% of the molecular mass of methane. In many cities, methane is piped into homes for domestic heating and cooking. In this context it is usually known as natural gas, which is considered to have an energy content of 39 megajoules per cubic meter, or 1,000 BTU per standard cubic foot. Liquefied natural gas (LNG) is predominantly methane (CH4) converted into liquid form for ease of storage or transport. Refined liquid methane is used as a rocket fuel. Methane is reported to offer the advantage over kerosene of depositing less carbon on the internal parts of rocket motors, reducing the difficulty of re-use of boosters. Natural gas, which is mostly composed of methane, is used to produce hydrogen gas on an industrial scale. Steam Methane Reforming, or SMR, is the most common method of producing commercial bulk hydrogen gas. More than 50 million metric tons are produced annually worldwide (2013), principally from SMR of natural gas. Much of this hydrogen is used in petroleum refineries, in the production of chemicals and in food processing. Very large quantities of hydrogen are used in the industrial synthesis of ammonia. This reaction is strongly endothermic (consumes heat, ΔHr= 206 kJ/mol). Additional hydrogen is obtained by the reaction of CO with water via the water-gas shift reaction. This reaction is mildly exothermic (produces heat, ΔHr= -41 kJ/mol). The two main routes for geological methane generation are (i) organic (thermally generated, or thermogenic) and (ii) inorganic (abiotic). Thermogenic methane occurs due to the breakup of organic matter at elevated temperatures and pressures in deep sedimentary strata. Most methane in sedimentary basins is thermogenic; therefore, thermogenic methane is the most important source of natural gas. Thermogenic methane components are typically considered to be relic (from an earlier time). Generally, formation of thermogenic methane (at depth) can occur through organic matter breakup, or organic synthesis. Both ways can involve microorganisms (methanogenesis), but may also occur inorganically. The processes involved can also consume methane, with and without microorganisms. The more important source of methane at depth (crystalline bedrock) is abiotic. Abiotic means that the methane formation took place involving inorganic compounds, without biological activity, either through magmatic processes or via water-rock reactions that occur at low temperatures and pressures, like serpentinization. The final step in the process is catalyzed by the enzyme methyl coenzyme M reductase (MCR). Ruminants, such as cattle, belch methane, accounting for ~22% of the U.S. annual methane emissions to the atmosphere. One study reported that the livestock sector in general (primarily cattle, chickens, and pigs) produces 37% of all human-induced methane. A 2009 study found that at a conservative estimate, at least 51% of global greenhouse gas emissions were attributable to the life cycle and supply chain of livestock products, meaning all meat, dairy, and by-products, and their transportation. A 2013 study estimated that livestock accounted for 44% of human-induced methane and ~15% of human-induced greenhouse gas emissions. Many efforts are underway to reduce livestock methane production, such as medical treatments and dietary adjustments, and to trap the gas to use as energy. The state of California has been particularly active in this area. Most of the subseafloor is anoxic because oxygen is removed by aerobic microorganisms within the first few centimeters of the sediment. Below the oxygen replete seafloor, methanogens produce methane that is either used by other organisms or becomes trapped in gas hydrates. Other organisms utilize methane for energy and are known as methanotrophs (methane-eating). Consortia of Archaea and Bacteria have been found to oxidize methane via Anaerobic Oxidation of Methane (AOM); the organisms responsible for this are Anaerobic Methanotrophic Archaea (ANME) and Sulfate-Reducing Bacteria (SRB). There is little incentive to produce methane industrially. Methane is produced by hydrogenating carbon dioxide through the Sabatier process. Methane is also a side product of the hydrogenation of carbon monoxide in the Fischer–Tropsch process, which is practiced on a large scale to produce longer-chain molecules than methane. Example of large-scale coal-to-methane gasification is the Great Plains Synfuels plant, started in 1984 in Beulah, North Dakota as a way to develop abundant local resources of low-grade lignite, a resource that is otherwise difficult to transport for its weight, ash content, low calorific value and propensity to spontaneous combustion during storage and transport. Power to methane is a technology that uses electrical power to produce hydrogen from water by electrolysis and uses the Sabatier reaction to combine hydrogen with carbon dioxide to produce methane. As of 2016, this is mostly under development and not in large-scale use. Theoretically, the process could be used as a buffer for excess and off-peak power generated by highly fluctuating wind generators and solar arrays. However, as currently very large amounts of natural gas are used in power plants (e.g. CCGT) to produce electric energy, the losses in efficiency are not acceptable. Methane can be produced by protonation of methyl lithium and methylmagnesium iodide. In practice, a requirement for pure methane will be filled with a steel gas bottle from standard suppliers. Methane was discovered and isolated by Alessandro Volta between 1776 and 1778 when studying marsh gas from Lake Maggiore. It is the major component of natural gas, about 87% by volume. The major source of methane is extraction from geological deposits known as natural gas fields, with coal seam gas extraction becoming a major source (see Coal bed methane extraction, a method for extracting methane from a coal deposit, while enhanced coal bed methane recovery is a method of recovering methane from non-mineable coal seams). It is associated with other hydrocarbon fuels, and sometimes accompanied by helium and nitrogen. Methane is produced at shallow levels (low pressure) by anaerobic decay of organic matter and reworked methane from deep under the Earth's surface. In general, the sediments that generate natural gas are buried deeper and at higher temperatures than those that contain oil. Methane is generally transported in bulk by pipeline in its natural gas form, or LNG carriers in its liquefied form; few countries transport it by truck. Methane concentration evolution from 1987 to December 2018 at Mauna Loa (Hawaii). In 2010, methane levels in the Arctic were measured at 1850 nmol/mol. This level is over twice as high as at any time in the last 400,000 years. Historic methane concentrations in the world's atmosphere have ranged between 300 and 400 nmol/mol during glacial periods commonly known as ice ages, and between 600 and 700 nmol/mol during the warm interglacial periods. The Earth's oceans are a potential important source of Arctic methane. Methane is an important greenhouse gas with a global warming potential of 34 compared to CO2 (potential of 1) over a 100-year period, and 72 over a 20-year period. The Earth's atmospheric methane concentration has increased by about 150% since 1750, and it accounts for 20% of the total radiative forcing from all of the long-lived and globally mixed greenhouse gases (these gases don't include water vapor which is by far the largest component of the greenhouse effect). Methane clathrates (also known as methane hydrates) are solid cages of water molecules that trap single molecules of methane. Significant reservoirs of methane clathrates have been found in arctic permafrost and along continental margins beneath the ocean floor within the gas clathrate stability zone, located at high pressures (1 to 100 MPa; lower end requires lower temperature) and low temperatures (< 15 °C; upper end requires higher pressure). Methane clathrates can form from biogenic methane, thermogenic methane, or a mix of the two. These deposits are both a potential source of methane fuel as well as a potential contributor to global warming. The global mass of carbon stored in gas clathrates is still uncertain and has been estimated as high as 12,500 Gt carbon and as low as 500 Gt carbon. The estimate has declined over time with a most recent estimate of ~1800 Gt carbon. A large part of this uncertainty is due to our knowledge gap in sources and sinks of methane and the distribution of methane clathrates at the global scale. For example, a relatively newly discovered source of methane was discovered in an ultraslow spreading ridge in the Arctic. Some climate models suggest that today's methane emission regime from the ocean floor is potentially similar to that during the period of the Paleocene–Eocene Thermal Maximum (PETM) around 55.5 million years ago, although there are no data indicating that methane from clathrate dissociation currently reaches the atmosphere. Arctic methane release from permafrost and seafloor methane clathrates is a potential consequence and further cause of global warming; this is known as the clathrate gun hypothesis. 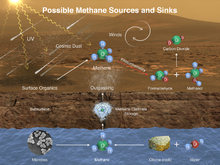 Methane is abundant in many parts of the Solar system and potentially could be harvested on the surface of another solar-system body (in particular, using methane production from local materials found on Mars or Titan), providing fuel for a return journey. Methane has been detected on all planets of the solar system and most of the larger moons. With the possible exception of Mars, it is believed to have come from abiotic processes. Methane (CH 4) on Mars – potential sources and sinks. The Curiosity rover has documented seasonal fluctuations of atmospheric methane levels on Mars. These fluctuations peaked at the end of the Martian summer at 0.6 parts per billion. Methane has been proposed as a possible rocket propellant on future Mars missions due in part to the possibility of synthesizing it on the planet by in situ resource utilization. An adaptation of the Sabatier methanation reaction may be used with a mixed catalyst bed and a reverse water-gas shift in a single reactor to produce methane from the raw materials available on Mars, utilizing water from the Martian subsoil and carbon dioxide in the Martian atmosphere. Methane could be produced by a non-biological process called ’'serpentinization[a] involving water, carbon dioxide, and the mineral olivine, which is known to be common on Mars. In November 1776, methane was first scientifically identified by Italian physicist Alessandro Volta in the marshes of Lake Maggiore straddling Italy and Switzerland. Volta was inspired to search for the substance after reading a paper written by Benjamin Franklin about "flammable air". Volta collected the gas rising from the marsh, and by 1778 had isolated the pure gas. He also demonstrated that the gas could be ignited with an electric spark. The name "methane" was coined in 1866 by the German chemist August Wilhelm von Hofmann. The name was derived from methanol. Etymologically, the word "methane" is coined from the chemical suffix "-ane", which denotes substances belonging to the alkane family; and the word "methyl", which is derived from the German "methyl" (A.D.1840) or directly from the French "méthyle" which is a back-formation from the French "méthylène" (corresponding to English "methylene"), the root of which is coined from the Greek "methy" (related to English "mead") and "hyle" (meaning "wood"). The radical is named after this because it was first detected in wood alcohol. The chemical suffix "-ane" is from the coordinating chemical suffix "-ine" which is from Latin feminine suffix "-ina" which is applied to represent abstracts. The coordination of "-ane", "-ene", "-one", etc. was proposed in 1866 by German chemist August Wilhelm von Hofmann (1818-1892). Methane is nontoxic, yet it is extremely flammable and may form explosive mixtures with air. Methane is also an asphyxiant if the oxygen concentration is reduced to below about 16% by displacement, as most people can tolerate a reduction from 21% to 16% without ill effects. The concentration of methane at which asphyxiation risk becomes significant is much higher than the 5–15% concentration in a flammable or explosive mixture. Methane off-gas can penetrate the interiors of buildings near landfills and expose occupants to significant levels of methane. Some buildings have specially engineered recovery systems below their basements to actively capture this gas and vent it away from the building. Landfills are the single largest source of U.S. man-made methane emissions. Methane gas explosions are responsible for many deadly mining disasters. A methane gas explosion was the cause of the Upper Big Branch coal mine disaster in West Virginia on April 5, 2010, killing 29. Industrial processes which produce methane are often required to control or abate their methane emissions, along with other VOCs. A thermal oxidizer is the most common type of air pollution control equipment used to reduce methane emissions. Methane clathrate, ice that contains methane. Methanogen, archaea that produce methane. Methanogenesis, microbes that produce methane. Methanotroph, bacteria that grow with methane. Methyl group, a functional group related to methane. This page is based on the Wikipedia article Methane; it is used under the Creative Commons Attribution-ShareAlike 3.0 Unported License (CC-BY-SA). You may redistribute it, verbatim or modified, providing that you comply with the terms of the CC-BY-SA.